The Esslinger Stadtmarketing & Tourismus GmbH (EST) - the official tourism partner of the City Esslingen am Neckar – welcomes you most heartily. Esslingen am Neckar is one of the few old towns in Germany which survived the Second World War without damage. 1200 years of history have left their traces in Esslingen architecture and art. On a walk through the town centre you will find the characteristic witnesses of all the architectural styles from the Middle Ages to art nouveau and the modern day. And above everything the symbols of the town tower - the Esslingen Burg (Castle), the Parish Church of St. Dionysius and the Church of Our Lady. Esslingen am Neckar would like to show itself from its best side. Decide for yourself, from which side: do you prefer it to be romantic, or rather more modern? Perhaps the history of wine in our city interests you, or a trip in a canoe on the idyllic Neckar canals. The Esslingen tourist board, called Esslinger Stadtmarketing & Tourismus GmbH (EST), offers you more than 40 different guided tours through Esslingen – a wide range of subjects and possibilities to discover Esslingen. Let yourself be surprised! Esslingen offers an almost original medieval town centre with its towers and gate-towers, magnificent half-timbered houses and churches. Up to the present day one can still see three gate-towers of the former town fortification: the Wolfstor, the Pliensauturm and the Schelztor. In the old town, at the foot of the vineyards, the late-Gothic “Frauenkirche” (Church of Our Lady) can be seen, with its filigreed spire. Below it is the modest former Dominican monastery church of St. Paul, Germany’s oldest voulted mendicant order church. The mighty parish church of St. Dionysius with its two towers is situated on the south side of the market-square. It was built in the 13th C. over the original chapel of the town, which was first mentioned in the year 777 – the “Vitalis-Zelle”. In the church interior there are beautifully restored stained-glass windows from the 13th C. – unique in Germany. Just a few steps away there is the Town Hall Square with the Baroque new City Hall and the incomparable Old City Hall – the most famous landmark of Esslingen. The fine curves and tower of the Renaissance façade from the 16th C. are the work of the Württemberg master court builder Heinrich Schickhardt. Five times a day the carrilon plays from the bell-tower. The sides and the back façade of the Old City Hall show the half-timbering style called “Swabian Man”, which is without equal in its massive size. Steep steps lead from the town up the covered fortification wall to the “Burg” with its dainty high watch-tower and the big tower. The visitor has a splendid view from here over the old Free city as far as the Swabian Alb. At the square “Hafenmarkt” you can find the oldest row of half-timbered houses so far discovered in Germany. Further Esslingen has the second oldest stone bridge in the middle of the town. The bridge was build in the 13th C. and is called the “Innere Brücke”. In the Middle Ages as well as today, a lot of shops on the bridge offer the visitors an amazing shopping centre. A lot of monastic administrative buildings, called “Pfleghöfe” are typical for Esslingen, too. These were administrative centres of monasteries situated outside Esslingen, but with buildings and land in Esslingen. The vineyards were of special importance. The yield was taken care of by the “Pfleghöfe”, which often had their own wineries and chapels. Directly to the Market Square one of the “Pleghöfe” is now the seat of Kessler Champagne Factory, the oldest in Germany, founded in 1826. In the Middle Ages a market-woman sold an onion to the devil to let him disappear, today the Esslingen tourist board invites guests every year at the end of July till the first week of August to the traditional “onion festival” on the market square, a superb festival with wine and Swabian delicacies. A legend about Esslingen pictures a very peculiar story. One day a smart women who sold her goods at a market stand recognized the devil and offered him a red onion instead of an apple. The devil didn’t realise the swap and took a lusty bite. The onion was so spicy that the devil disappeared immediately and never returned to Esslingen again. The population of Esslingen is called “Zwieblinger” and every year there is a festival that reminds us of that legend. During this festival there are various dishes on offer that include an onion in their recipe. Accompanying to a lot of summer festivals in Esslingen, guided adventure tours through Esslingen called “ghostwalks” or “crime-time”, combine a historical tour with an exciting adventure through the city. With a trip in a canoe on the idyllic Neckar canals visitors profit of an other amazing view of the medieval city. 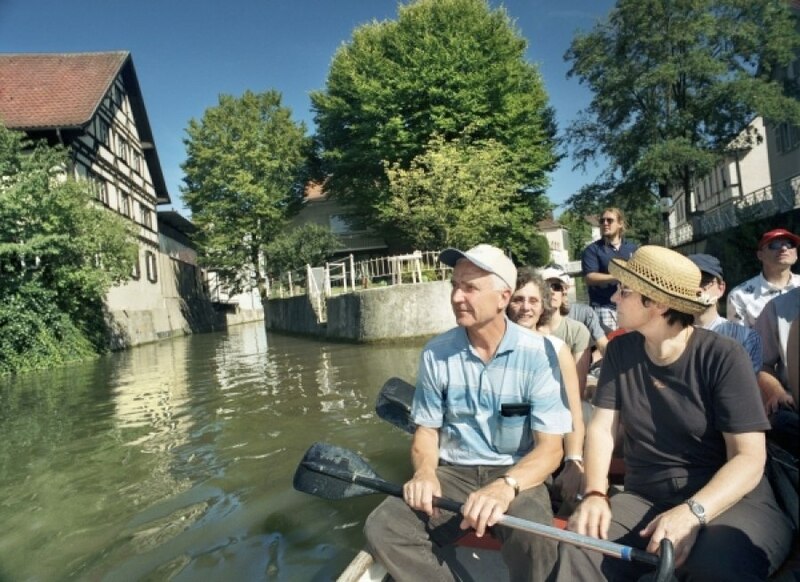 With a glass of Kessler sparkling wine on the boat tour you will have an unforgetable adventure in Esslingen, too. Esslingen is minted by its thousand year old wine tradition. In the Middle Ages wine was the reason for the richness and the status of the city. Until today the tradition of making wine has kept its place in the history of Esslingen. Esslingen is known for its heavy, full-bodied and fruity wines. In many cosy cellars in Esslingen you can have a taste of the wine accompanied with delicious swabian dishes. Directly to the Market Square, the Kessler Champagne Factory, the oldest in Germany, invites you to a glass of sparkling wine. In 1826 Georg Christian Kessler founded the Kessler Sparkling Wine Cellars in Esslingen. In the 19th C. he was drawn to France, where he soon found success as “associé et co-directeur” at the Veuve Cliquot Ponsadin champagne cellars in Reims. The widow Clicquot’s exquisite art of transforming wine into fizzy champagne fascinated Kessler to such an extend that he wanted to try the process at the Neckar with Württembergian grapes. The experience of champagne manufacturing that Kessler gained in Reims led to the launch of “Swabian bubbly”. Till today sparkling wine is manufactured in the cellars of Esslingen. To visitors they offer guided tours through the cellars, which can be booked at the Esslingen tourist board. Enjoy yourself in the unique art nouveau bath which was founded by Oskar Merkel in 1907. A lavishly arranged relaxation area and 3 swimming pools await its visitors. Carefully designed theme saunas, a Jacuzzi, a spacious roof terrace including chill out rooms and a cafeteria and a private therapy centre will make your stay unforgettable. The medieval Christmas fair in Esslingen is known for its uniqueness and individuality. It is definitely a highlight for everyone who loves handcraft. It is said to be one of the most beautiful Christmas Fair in Germany. Only 15 minutes away from the centre of Stuttgart it holds a truly interesting mix of stands that are run by people with different traditional professions. Esslingen offers with its beautiful half-timbered houses, its narrow streets in the old city and its nice market place an impressive scenery for one of the most interesting Christmas Markets. A time machine will send Esslingen back into the exciting times of the Middle Ages. The medieval market will take place on the Town Hall Square, which provides a contemporary atmosphere. At this unique Medieval Christmas Market during wintertime in Southern Germany you will experience many fascinating attractions: Music, magic, sorcery, fire-eater and a lot more. A wide array of cultural events, will be presented on two stages, including music from long-forgotten times played on historical instruments and various open air concerts free of charge. The medieval stands of the traditionally dressed craftsmen present calligraphy, leathery, silver jewellery, dyer’s trade and a lot more. The Christmas Market will be held concurrently with the medieval market on the Market Place. You will find the ‘living’ crib on the Christmas Island on Post-Michel Square. Lively traders and around 160 beautifully decorated stands offer a really outstanding atmosphere. Booking-service and all further information about the city, the first place for you to go is the City Information Office of the Esslinger Stadtmarketing & Tourismus GmbH (EST). In the “Spät´sches” House on the Market Square you will find many offers and an all-round service for your discovery tour through the former Free City! There is a wide range of literature regarding city history, town maps, postcards, music CDs, wine and champagne "made in Esslingen", or lots of ideas for gifts from the Esslinger Publishers.